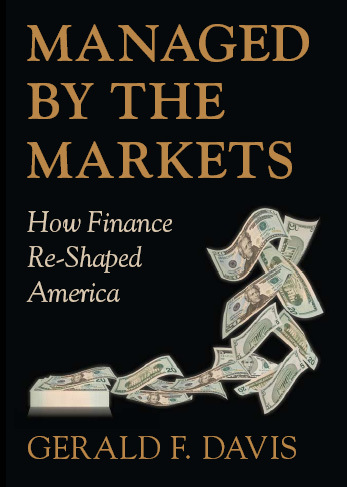 Congrats to Jerry Davis, this year's winner of the George Terry Book Award for his work Managed by the Markets: How Finance Re-Shaped America. The George Terry Book Award was presented at the AOM conference in Montreal. The George Terry Book Award recognizes the best book written by an academy member in the previous year. Jerry Davis needs no introduction but bear with me. Jerry Davis is the Wilbur K. Pierpont Collegiate Professor of Management at the Ross School of Business. He has published widely in management, sociology, and finance. He is currently Associate Editor of Administrative Science Quarterly. To mark this occasion Jerry has kindly taken the time to proved some background on his book as well as thoughts on the financial crisis. Hugs and Hand Pounds Jerry. Without further ado I give you Jerry Davis. When I started writing the book in early 2006, I was enjoying a great sabbatical at London Business School and pitched the idea of the book to David Musson at Oxford University Press, who was very supportive. The idea of a book on how finance had fundamentally altered American society seemed like one that might have a small but potentially enthusiastic audience among a few organizational scholars and economic sociologists. As often happens, it took far longer than I expected to finish a complete draft, which I sent to the press in early September 2008. The subsequent few weeks turned out to be eventful ones in the realm of “finance altering American society.” Fannie and Freddie were seized, Lehman went bankrupt and Merrill sold itself, Washington Mutual and several other big banks failed, credit markets froze, and we seemed to be on the precipice of economic Armageddon, all caused by finance gone wild. The publisher therefore decided in October that there might be a somewhat larger audience for the book and proposed to issue it as a well-priced hardback aimed at a more general readership. But they also requested that I revise the book in light of all that had just happened, and that I do so as quickly as possible. While I was revising, Bush’s vast bank bailout got underway, Obama was elected president, and crazy things continued to happen in finance. The final manuscript went to the publisher November 14, and in the ensuing months approximately 10,000 books on the financial crisis appeared, albeit almost all on very recent events or particular players rather than on the broad topic of finance maiming society. I think the financial crisis has reinforced several things I argued in the book. One claim that had received some skepticism was my assertion that securitized mortgages had changed how people viewed homes and led them to see their house as a financial asset akin to a stock option. Several people told me that this did not fit their experience at all. But it turned out to be truer than I had guessed, as in recent months the highest mortgage default rates are on houses with mortgages over $1 million. For the wealthy, and increasingly for the rest of us, securitization has stripped away the sentimental veil and revealed “home” to be just another class of investment (like our family and friends, our education, our personality, our knowledge of wines, and so on). On the other hand, recent statistics show that there is enough anxiety about the stock market that many people are exiting the market, reversing the trend of the previous 30 years or so. I’m not sure that people are turning their backs on the financial worldview, however, as it has become pretty entrenched. And I’m still waiting for the Facebook “Social Capital Asset Pricing” app to come out. One argument in the book that is particular relevant for OMT is the idea that the “society of organizations” is kaput, at least within the US. Since the end of the Second World War, the US has relied on employers, particularly corporations, to provide core social welfare functions such as health care, training, and retirement income. It’s pretty clear that this system has fallen apart. The biggest employers used to be major manufacturers like GM, Ford, and GE, as well as some service firms like AT&T, all of which offered implicit guarantees of long-term employment that bound them to their employees. Now the biggest employers are overwhelmingly in retail, where wages and benefits are low and few employees stick around long enough to collect any retirement benefits, even if they existed. Moreover, the economic crisis has pressed many big companies to pare back or drop whatever benefits they used to offer. As a nation, we have not yet come to grips with the fact that the old corporate-centered social welfare system is not sustainable, and that we need a new model. (This muddle was especially apparent during the recent debate about health care reform.) Bush tried to do this with his “Ownership Society” idea, where private retirement and health care accounts would be invested in financial markets, but I’m not sure there will be a lot of enthusiasm for reviving this idea, given the market’s performance over the past decade.